At approximately 11:20pm on Wednesday, November 7, 2018, emergency 911 dispatch received multiple calls of an active shooter in the Borderline Bar & Grill in Thousand Oaks. By 11:26pm Ventura County Sheriff’s Sergeant Ron Helus and a California Highway Patrol Officer arrived on scene and heard gunfire coming from inside the bar, which was occupied by nearly 200 college students. Sergeant Helus immediately made entry into the bar and engaged the suspect. In the exchange of gunfire Sergeant Helus was struck and severely wounded. The CHP Officer was able to pull Sergeant Helus from the bar and he was transported to a local hospital. Tragically, his wounds were not survivable and Sergeant Helus died early Thursday morning, November 8th. Eleven citizens were also shot and killed in the incident, numerous others were wounded. The suspect was later found dead inside the bar. 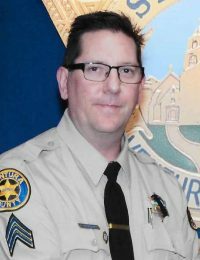 Sergeant Ron Helus, age 54, was a 29 year veteran of the Ventura County Sheriff’s Office. He is survived by his wife and son. Additional details and funeral information will be forwarded as available.